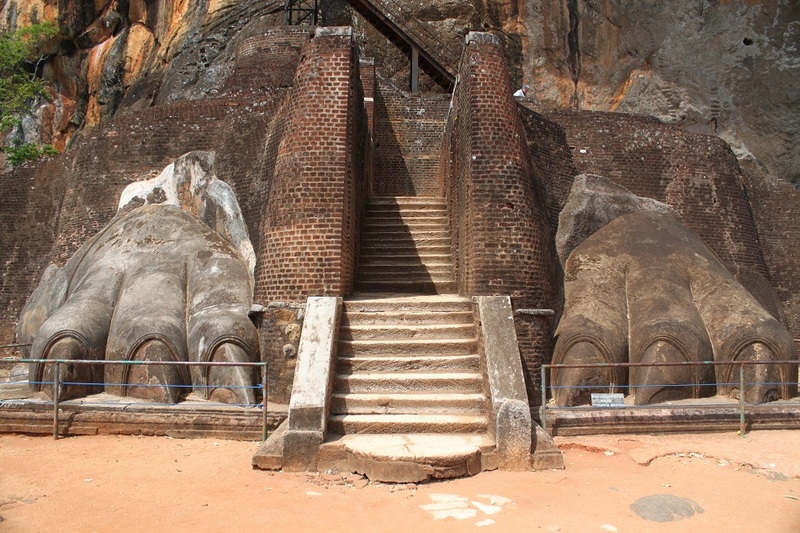 A Dream Palace, Sigiriya | What an Amazing World! 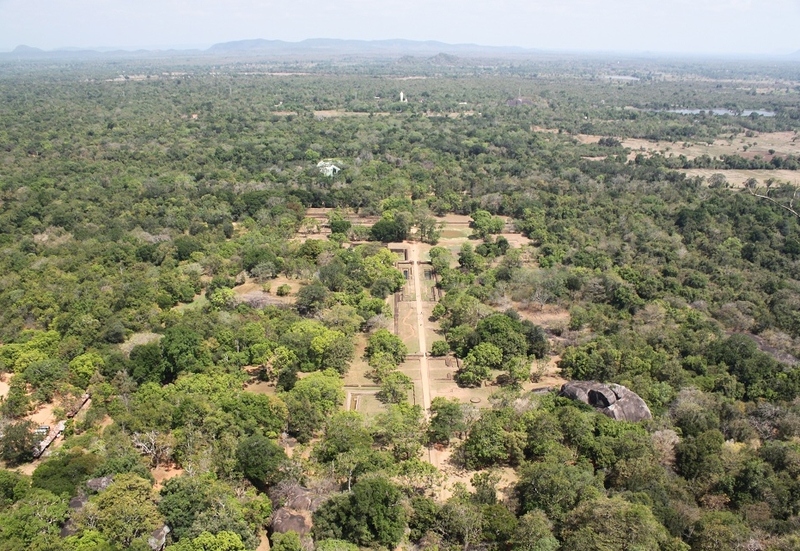 Two amiable men in white shirts smile at me when the car approaches the drop point, near the entrance to Sigiriya Rock Fortress ─ probably the most prominent landmark of the island nation of Sri Lanka. As soon as I get off the car, the first man greets me, “Konnichiwa, Japan-san!”. Bewildered for a slight second, then I politely decline his offer and walk directly to the ticket counter while the second man keeps saying the exact same thing repeatedly a few moment later. 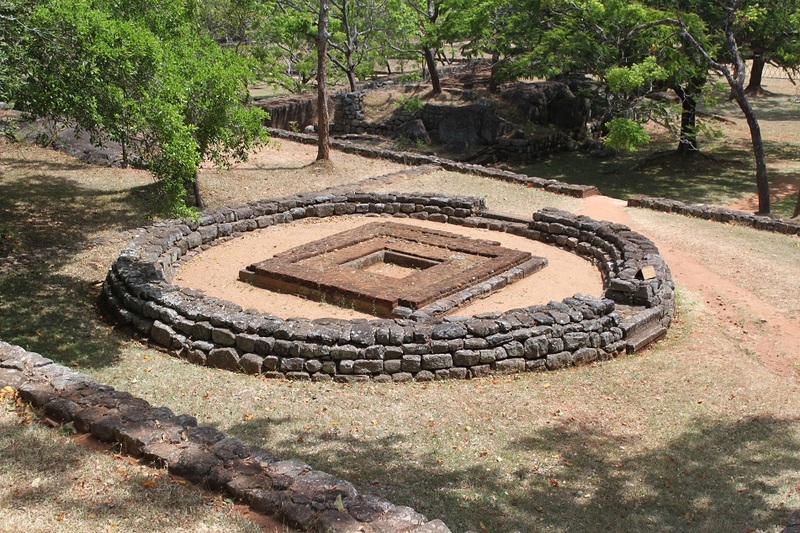 I always remember what Suresh, my reliable driver in Sri Lanka, said to me the day before that some local guides tend to make up stories about the history of an ancient site, enticing tourists with catchy tales. In my past travels, local people in different countries thought of me as Malaysian, Singaporean, Chinese, Filipino, Thai, or even Maori of New Zealand. So, now Japanese is officially added to the list. However, the unexpected amusement does not last long. My lightheartedness turns into sudden tense feeling as I reach the ticket counter. A big sign board written in three languages ─ Sinhalese, Tamil and English ─ explicitly warns every visitor about the possible attack from hornets around Sigiriya and the obligation to wear protective mask for visitor’s own safety. Nevertheless when I walked toward the counter I did not see anyone wearing such mask and the lady at the counter did not say even a single word about the threat. Anxiously I walk toward the entrance gate after paying for the rather steep ticket while hoping that visiting Sigiriya is worth all the money I have just spent. Long before I started wandering to far-flung places, I have read on the travel section of an Indonesian newspaper about Sigiriya. At that time the protracted civil war still engulfed this island nation. But here I am now, walking toward the same monolith that I saw on that page on the newspaper, three years after the war ended. Getting to the base of the rock is quite easy as I only need to follow a straight dirt path, barren by the sun and countless footsteps of people for centuries. Every few hundreds meters or so, I have to take the steps made from bricks, bringing people closer to the base of the monolith in a subtly sloping terrain. Once the giant ancient volcanic plug is close enough, I can see large boulders flanking the steps leading to the rock. 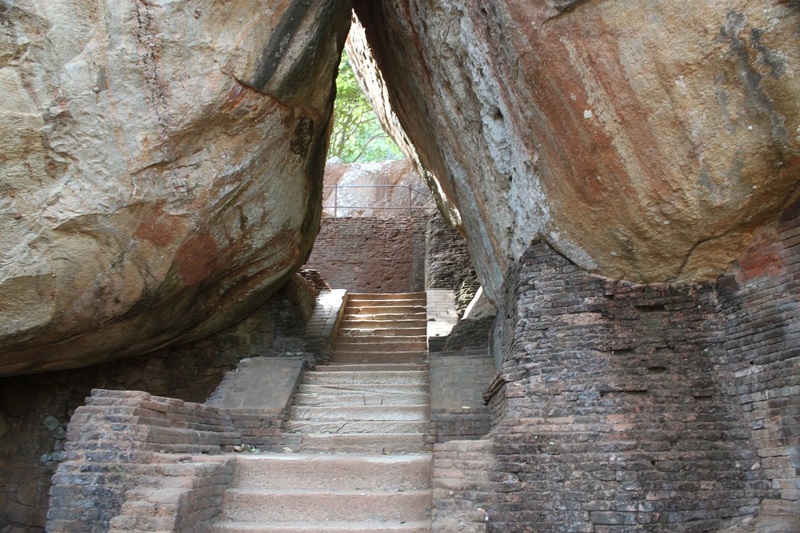 After passing through the boulders, the path leading to the Mirror Wall ─ one of the most important features of Sigiriya Rock Fortress ─ is now clearly visible. The Mirror Wall is made of a porcelain-like material, so well-polished that anyone walked alongside it could see his reflection, hence the name. Over the time, many visitors scribbled thousands of words on the wall until the authority decided to protect it and keep a safe distance between the wall and visitors’ pathway. 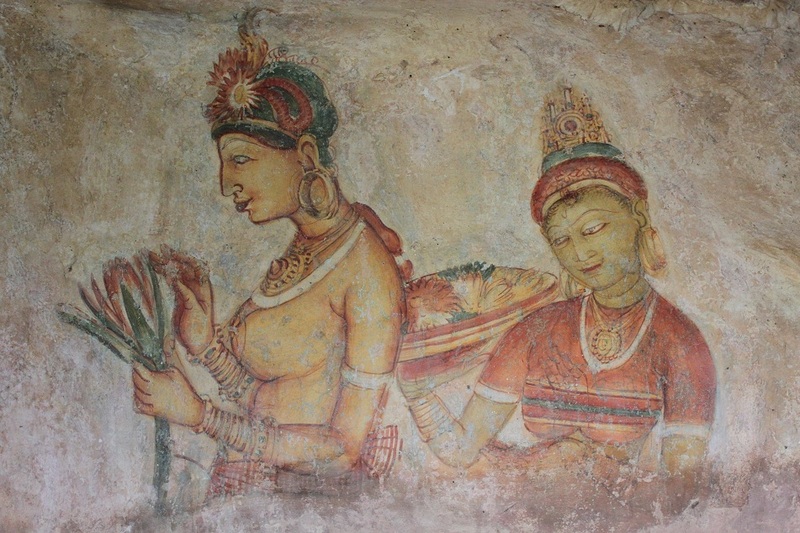 Today at the middle of the pathway behind the Mirror Wall, a spiral staircase brings visitors to the few remaining frescoes of Sigiriya. Although it looks old and rusty, the staircase seems to be strong enough to function properly until a few more years to come. 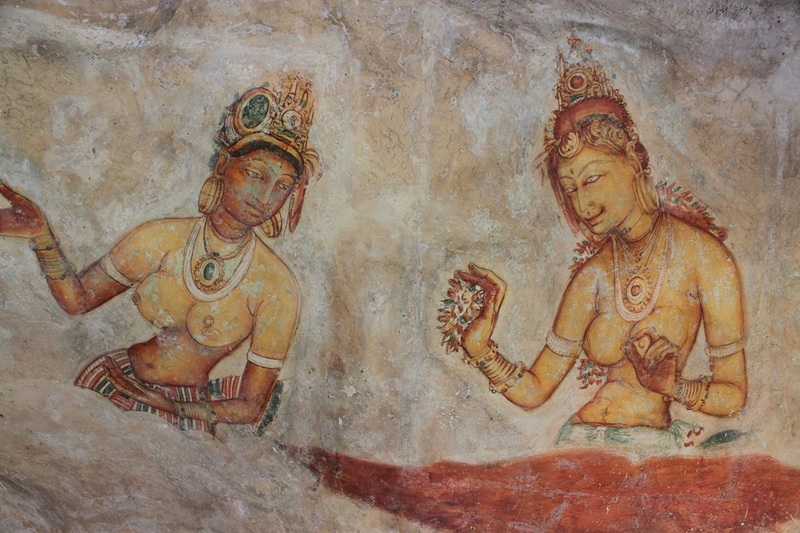 Back in the early 20th century, Sigiriya Rock Fortress was adorned with hundreds of pictures of graceful female figures, painted during the time when the it still served as a royal palace. However when it was converted into a monastery again, just like how it used to be before being used as a palace, most of the paintings were wiped out in order not to be a distraction for the monks. Fortunately a few of the frescoes are still intact, giving present-day visitors a glimpse of how impressive it must have looked back then. 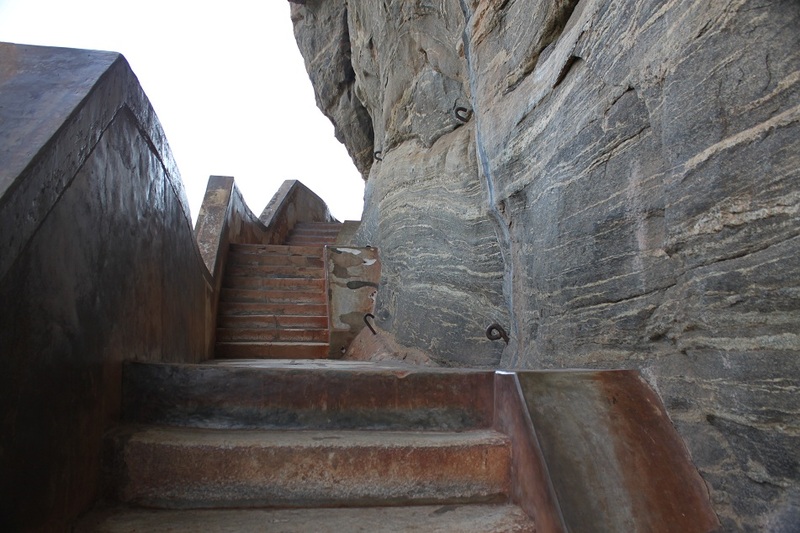 After going down to the Mirror Wall again, I follow the path which leads to the Lion Gate where two giant lion paws flank the final stairs to the top of the rock. Even though the lion face had long crumbled, the sheer size of the paws are a quite remarkable sight, particularly in such height where wind blows rather hard and occasionally creates swirling minor vortex ─ leaving me in admiration for the imagination of the king or architect who envisioned this rock fortress centuries ago. At this point I no longer take heed on the warnings for the possible attack of the hornets. Climbing the final leg of the stairs, I prepare myself for being amazed for what I will see upon reaching the summit. 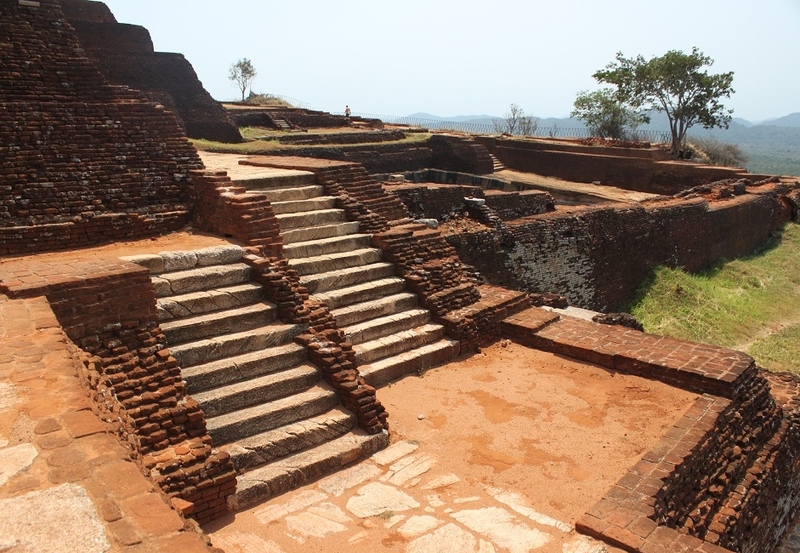 Larger than I previously thought, the ruins of the royal palace are truly the evidence of ancient Sri Lankan’s engineering marvel. Multi-story palace with a large bathing pool on the top of a rock with the sweeping view of rivers, mountains and dense forests around it sounds something only a very ambitious king dared to envision. King Kassapa that is, back in the late 5th century AD. 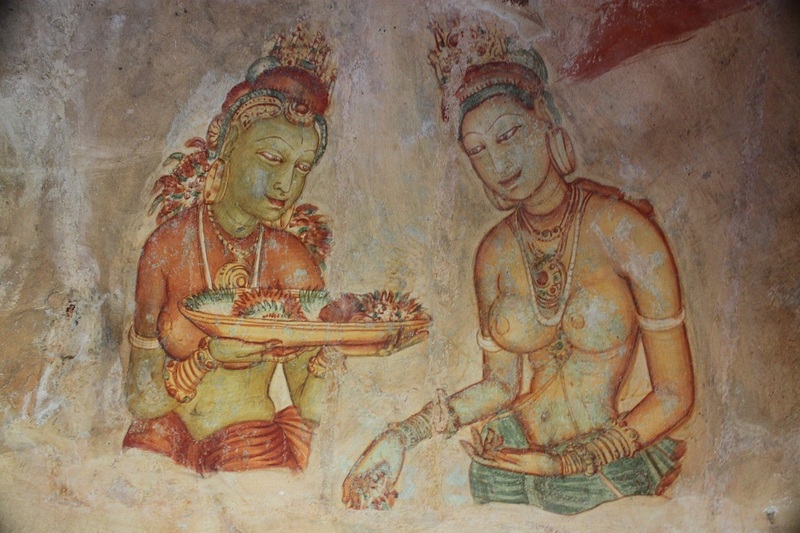 Nevertheless, behind its beauty, Sigiriya was the center of a long rivalry between King Kassapa and his brother, Mugalan, who fled to India for sanctuary. Provoked to fight each other by a former chief or army who had his own hidden agenda, the two brothers contended for the throne of the kingdom. Mugalan was born from a different mother who came from a more noble family than his older brother’s mother’s bloodline. Therefore, despite being the younger son of the former king, he believed that he was the rightful heir to the throne. The rivalry continued for 18 years until Mugalan with the aid of foreign troops from India managed to topple his brother. The new king then restored the palace into a monastery once again. Serving both as a peaceful retreat and a surveillance post, the ancient palace is now yet to be fully excavated and restored, waiting for the right technology to be invented ─ certainly a great thing for young archaeologists who might start to run out of places to be studied in their field experience. Having to squat sometimes in order not to be pushed away by the unexpectedly very strong wind, I stay a little longer at the summit only to gaze upon the magnificent view this place has to offer. 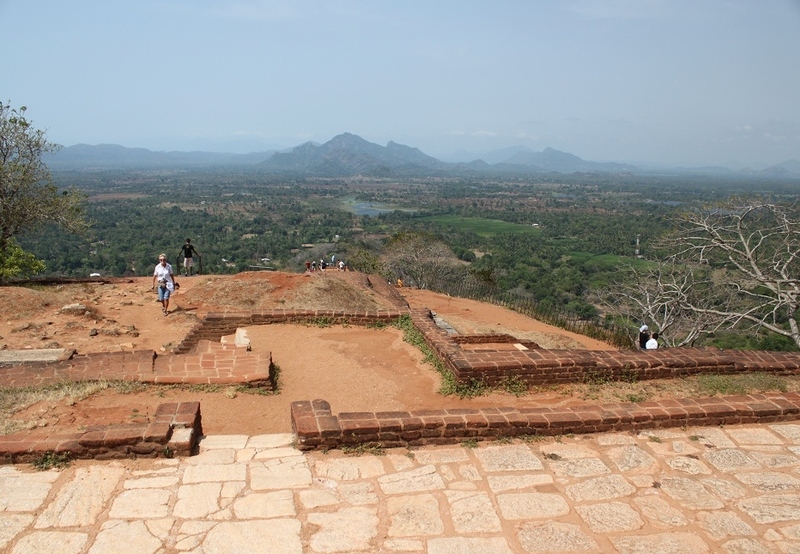 Not only I am on the top of Sigiriya Rock Fortress, but with no doubt it is also the top of my experience in Sri Lanka. I’m really enjoying your series on Sri Lanka! Thanks for reading, Denise! I’m glad you are. So glad you enjoyed it, Bama, though sad you felt suckered by the cost of the entrance price! Did you know that the fountains still sometimes spring to life (once in a blue moon, it would seem, depending on the monsoons)? I don’t know how often it’s happened, but it occurred once when I was living here about 15 years ago. I didn’t see them, but the photos in the paper were marvellous! 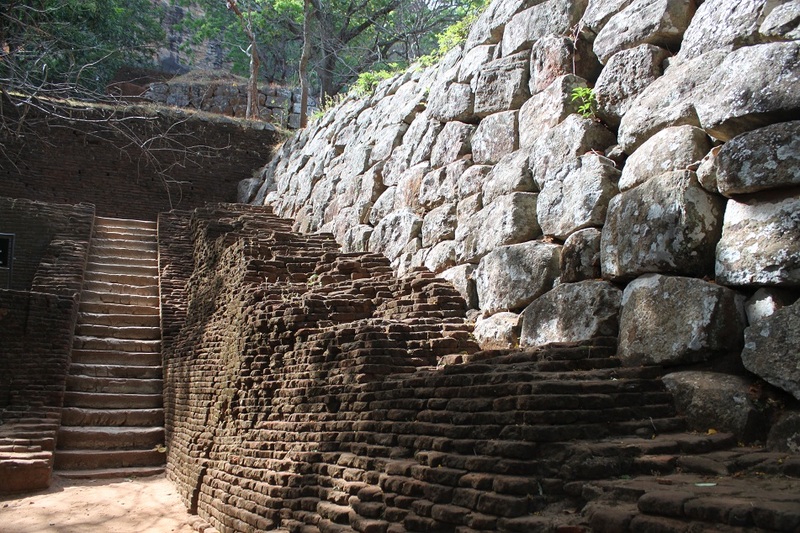 You might be interested in this link about “The Warrior Bees of Sigiriya” http://natgeodigitalsignage.com/film/1395/warrior-bees It’s directed by a friend – Chandi Jayawickrama, for National Geographic Channel. Oh I’ve never heard of the fountains before and I didn’t even notice any spot looking like fountains when I was there. You must be really lucky to be able to watch those fountains, Meredith! Btw I just took a look at the link you gave me, and that leaves me wondering why I didn’t see any of the bees because I went there in June. Well, I consider myself lucky then because from what your friend’s article says they are definitely not the animals you wish to surround you. Yes, I think you are lucky, we often hear of people being badly bitten – last year a whole busload of school kids were attacked. My suspicion is that they invited attack by crowding the hives … I was there once when they were around, but we walked past (probably holding our breath), only moving our legs. Nothing untoward, hence my suspicion – and you know what kids are like! Wow!!! I can picture in my mind how remarkable the sight might look! Actually I have a plan to revisit Sri Lanka in the future. Hopefully when I do, those fountains will spring to life right before my eyes. Well, kids will be kids. But it’s so horrible to imagine how bad they were attacked. I hope when the hornets are around, all visitors are obliged to wear the protective mask. Thank you for posting the Sri Lanka series! It’s all so beautiful and larger than life. Sri Lanka is inspiring. Thanks Elaine! For such a small country, Sri Lanka is amazingly full with inspiring sites, indeed. What an awe-inspiring place to build a royal palace! I’m especially taken with the bathing pool at the summit… was it a difficult climb? 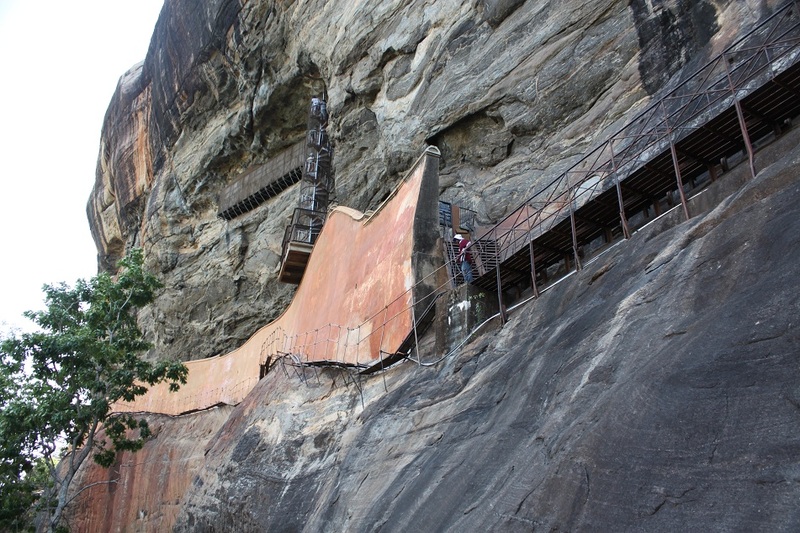 Risk of hornets aside, I can just imagine that Sigiriya would be perfect at sunrise or sunset. 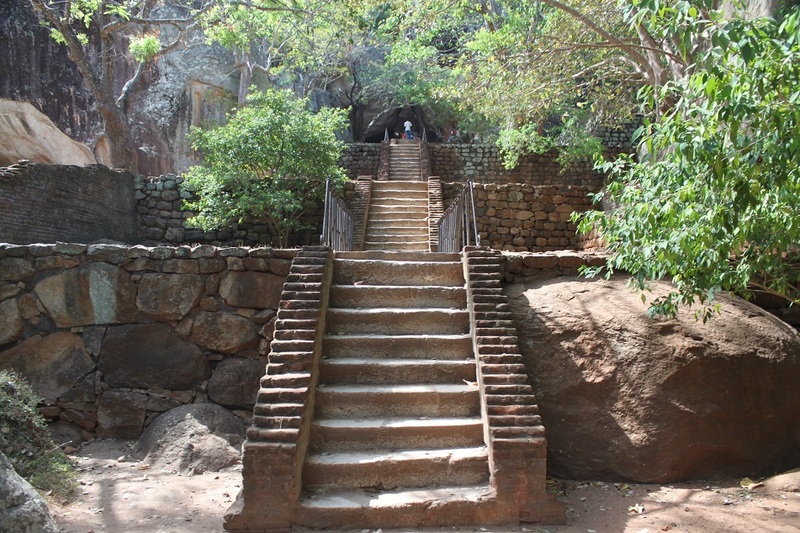 I guess that hike to Lao Zhai Hill a week earlier made the climb to Sigiriya’s summit far less challenging. You should check what Meredith told me on her previous comments about the fountains. This place was definitely the highlight of my Sri Lanka trip. Oh and yes, you would get postcard perfect pictures at sunrise or sunset. I wish I were there with you, Bama. Your narration is very “pulling”. One of the best places I had seen in my life. Thanks for sharing the pictures and experience! And thanks for reading, Sony! 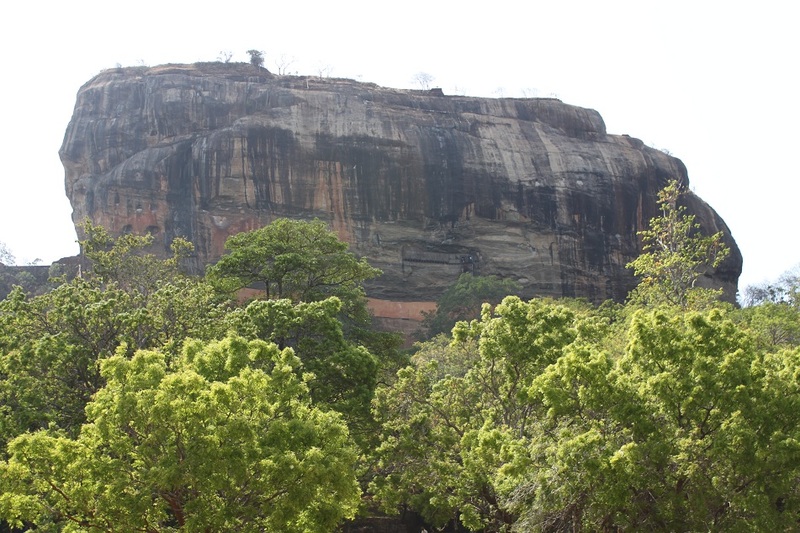 Sigiriya is indeed a special place. Btw, I’m looking forward to reading more stories on Saudi Arabia – a country rarely covered in other blogs. Thanks for saying that, Bama! I’m working on it. The dealy is caused by my busy schedule at work (unlike in the Philippines where I have all the time I want). The frescos is particularly interesting and nice. I’m glad when it was converted into a monastery again, they left some frescoes intact. The first picture is great. Love the composition. And the palace itself, man, I bet you must feel overwhelmed to see such architecture – or at least I will. This is definitely an awesome place to visit. Nice post Bam! 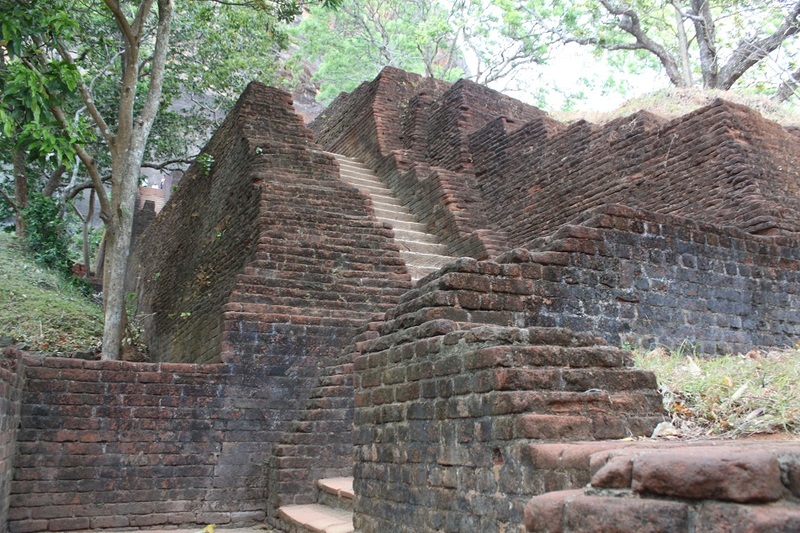 When I read the article about Sigiriya in Kompas when I was in high school, I was instantly captivated by its beauty. So visiting this place last June was like a dream come true. Thanks Bin! Hey Bama how are you doing? See you keep making amazing trips around Asia! Asia is plenty of treasures to be discovered, by what I see in your posts. Hey Javi! It’s been a while! Yeah, I got the chance to go to some places in Asia last May and June, so I have plenty of stories to share. Asia is definitely rich in treasures, but for us in Asia, Europe is too. Spectacular indeed…the view and the lion gate! And intriguing history.The political conniving between the neighbours doesn’t seem to have changed one bit in all these centuries. We meddled in their affairs and paid with the life of a prime minister! Sadly, most people never learn from history. By the way, even though India herself is an amazing country (although I haven’t been there), but I’m quite certain that Sri Lanka will not fail you, Madhu. I have no doubt Bama. And your posts will have helped make my trip a reality sooner than later 🙂 How many days did you spend there in all? I’m glad they give you a little glimpse of what the country has to offer. In total I spent eight days in Sri Lanka. 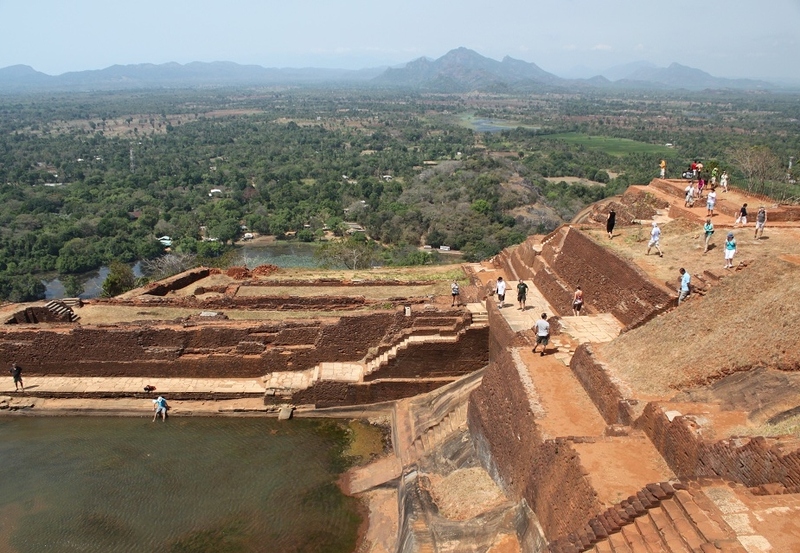 Hi Bama, I want to go to Sigiriya! Wow, the rock fortress is much more enornous than I thought! Your shot of the Lion’s Paws gave me chill. There’s something so powerful about it. 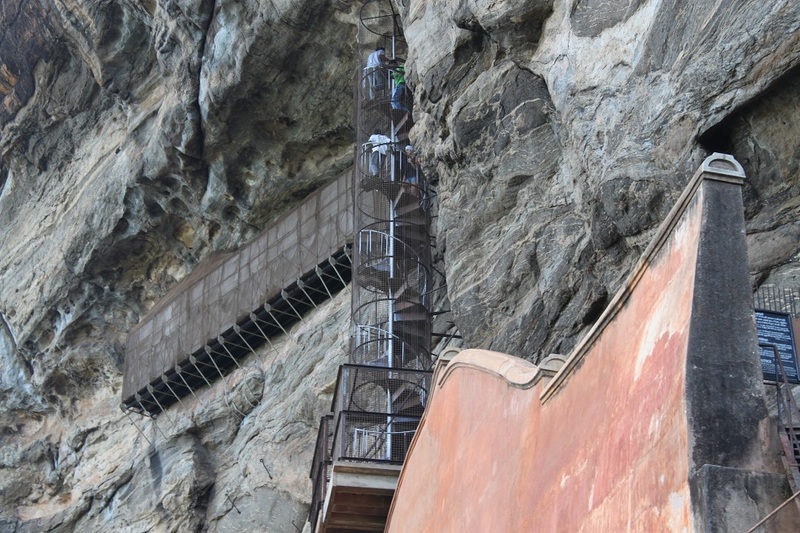 The frescoes, the steps, the views — they’re all amazing! And thanks for the historty bit. Really nice post. 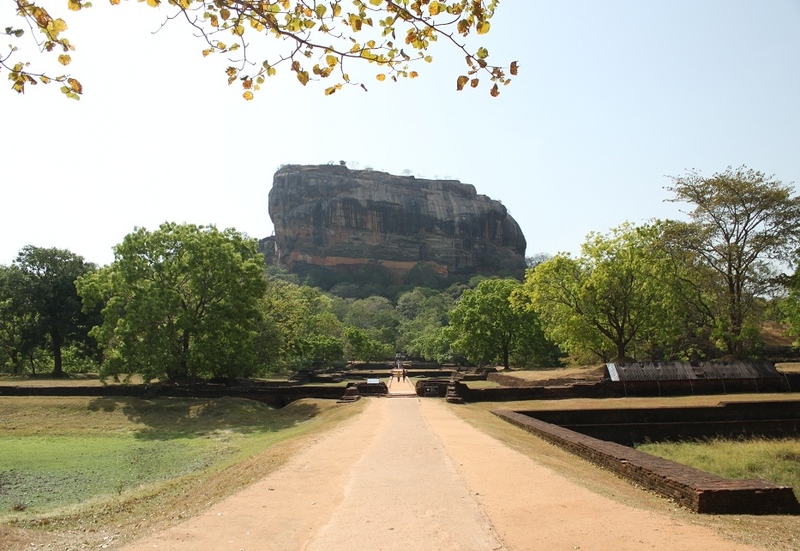 Marisol, if you only had one day in Sri Lanka, Sigiriya is definitely the place you shouldn’t have missed. And you’re right, those giant paws are the most striking feature of this monolith. Thanks for reading! Nice photos. When I visited in July, I saw no sign about the hornets. We paid the $30USD (!!!) entry and then were not allowed to see the frescos (here because of bees) and were told to climb anywhere else at our own risk because of the wasps. When we demanded our money back, the head of the site refused and then tried to bribe us with lunch. Bottom line: ask if it’s safe before paying. Oh that’s really bad, Lydia! I also had to pay that much but there was no hornet at all when I went. Thanks for the tips! it’s very useful for me when I come back one day, and for others too. Bama! I was just thinking how it has been a while since I’ve been able to surf some blog that I follow, and yours in particular came to mind…then you liked my new post! I guess that’s fate that I need to read some of your stuff, huh? I see I’ve missed a lot, but I really like this article. This seems like some awesome ruins to visit, and I especially like the Lion Paws at the Lion Gate. Reminds me of you trip to the ruins in Peru in a way. Thanks for sharing, and looking forward to reading some more of your stuff. Hi Nate! I know it’s been a while since the last time I checked your (two) blogs. What a coincidence that you’re also doing the same thing when I did that! 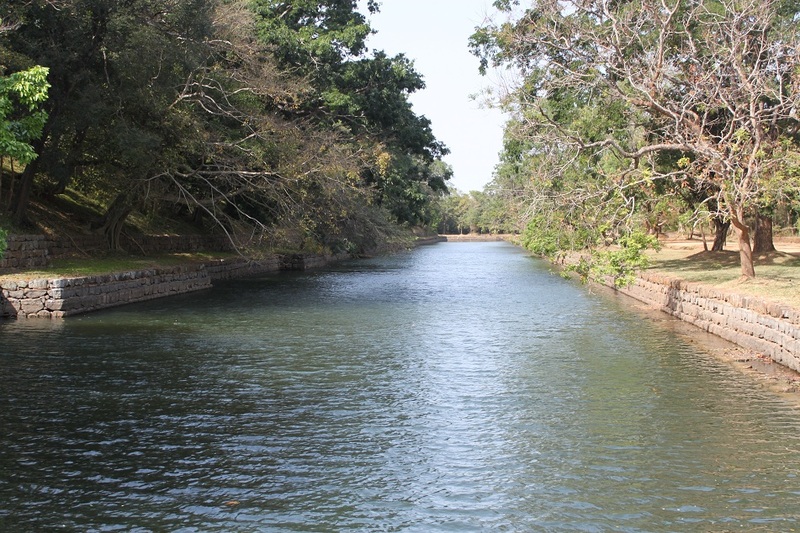 I know you would love Sri Lanka – definitely a place I would recommend to anyone interested in true natural beauty. But by the way, I haven’t been to Peru yet – I remember though how much your post inspired me to go. I hope this IS indeed a good sign for me! Incredible pictures!! I’m really enjoying your adventure. I also just started exploring more of Southern California which is where I live. Definitely want to do more international travelling in the future! good job and i look forward for more awesome posts. Thanks Snook! Exploring the places closest to where you live is actually an adventure in and of itself. I hope you’ll have more international traveling sooner than later! Good luck! Oh it’s the best thing from my trip to Sri Lanka! 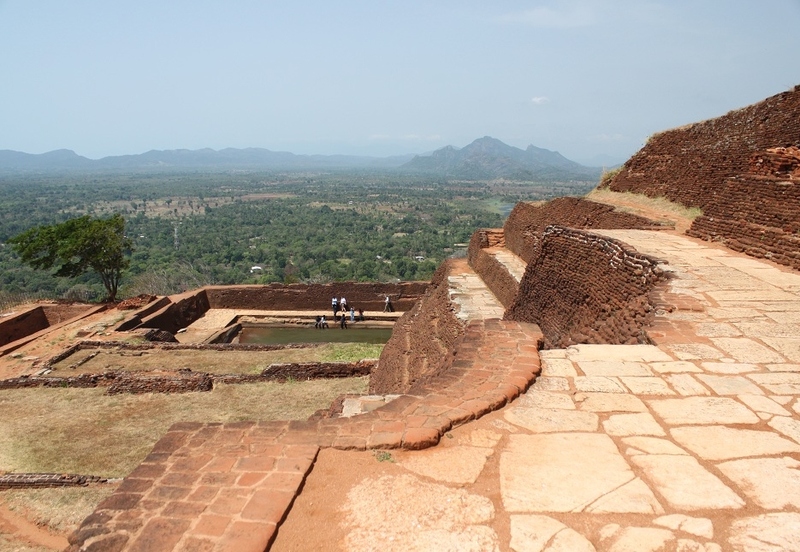 I love the setting and the history of Sigiriya and I don’t mind coming back in the future. Yeah, I think you’re right. They should make a movie here. 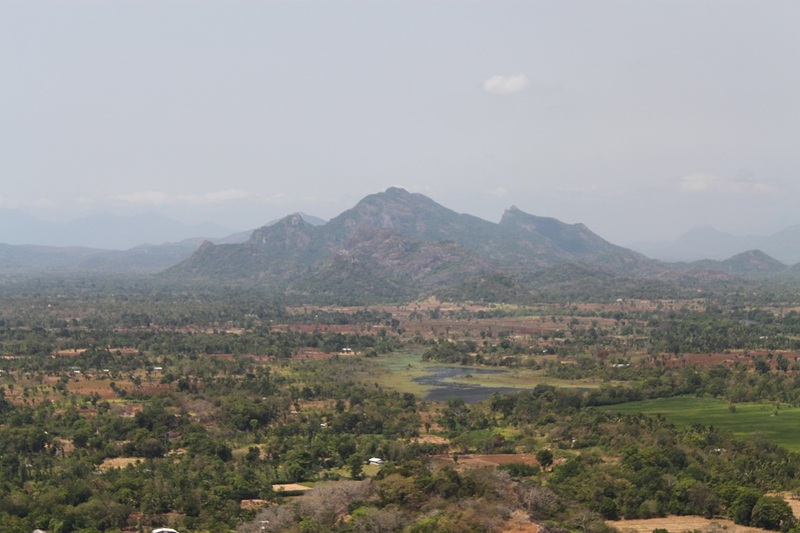 Amazing Pictures of Sri Lanka…. 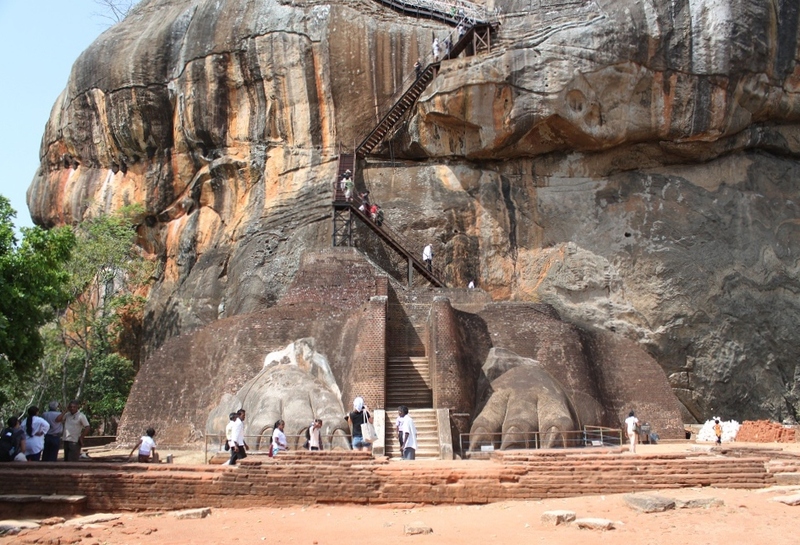 Sigiriya is indeed an amazing place to visit in Sri Lanka! Pingback: In Search of Spices | What an Amazing World! The pictures really made me travel there, nice job! And I didn’t know much about this place, and Asia in general, so it’s always great for me to read your remote places posts (being from Buenos Aires, this is really the other side of the world). That spiral stairs must had been intense! My world-wishlist keeps growing and growing…. This is one of the best things about blogging: we learn about places so faraway from where we live. South America for me is one exotic corner of the world. I don’t know when I’ll get the chance to visit the region but it surely remains on top of my wishlist.